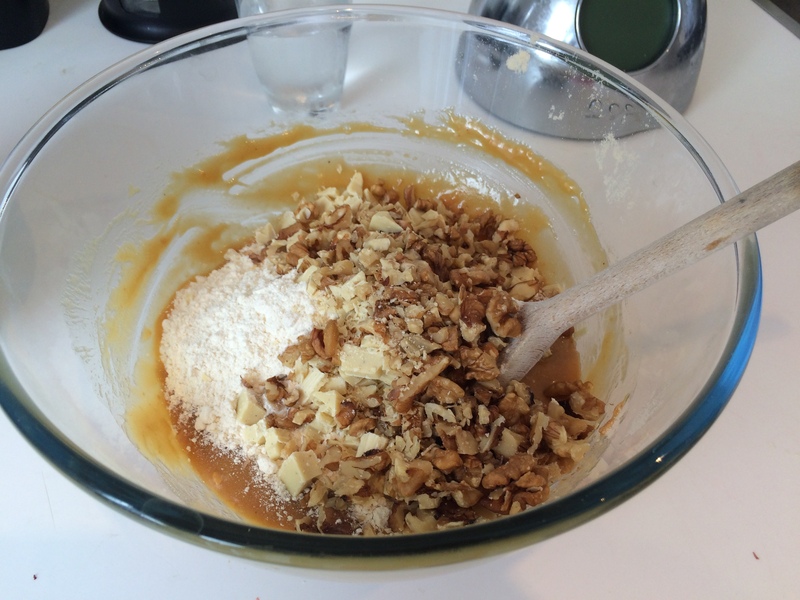 We stumbled across this recipe a couple of weeks ago when looking for a tasty treat to bake that we hadn’t made before. With a plentiful (and regular) supply of peanut butter in the cupboard, we knew the recipe had to contain this, so were thinking along the lines of peanut butter cookies. However, when we found this recipe for peanut butter blondies (which chocolate brownies), there was no competition. We’ve tried this recipe on people who are a fan of peanut butter and those who aren’t and the feedback from both is very positive. The squidgy peanut butter flavour is definitely there, but not too overpowering as the walnuts and white chocolate flavours keep your taste buds distracted. Basically what we’re hinting at is that when you bake these, be prepared for them not to last long at all. The recipe comfortably makes 16 very rich blondie portions. Pre-heat the oven to 170C. Grease a 20cm square baking dish and line with greaseproof paper. 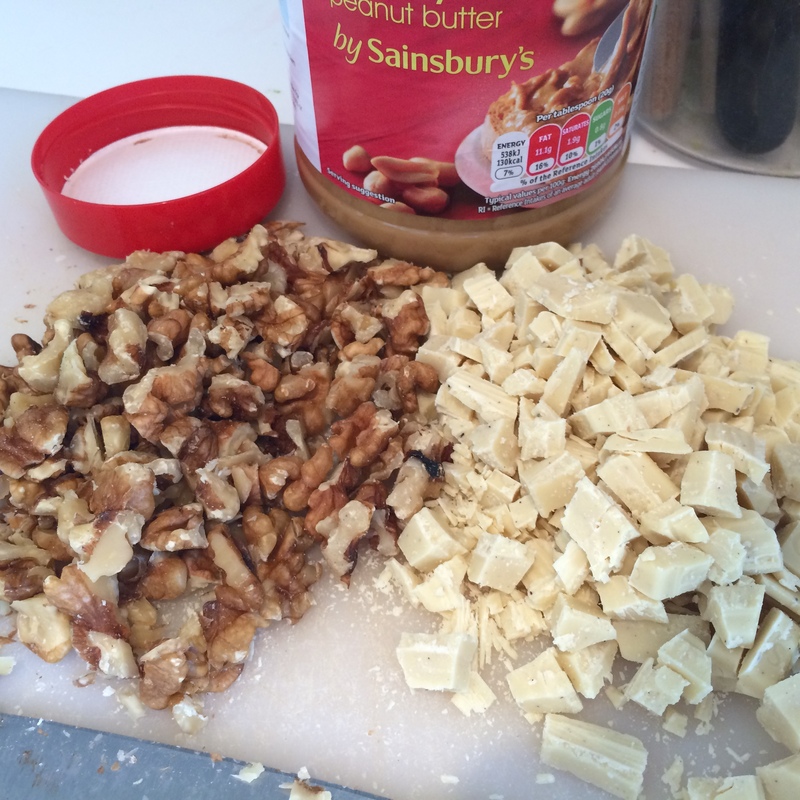 In a large beat the butter and peanut butter together until creamy. Add the vanilla, sugar and egg and beat again until light. Finally sift in the flour add the chopped white chocolate and walnuts and fold together. Spoon the mixture into a the prepared baking dish and bake for 35 – 40 minutes until the blondies have a nice crust but still just fudge-like in the middle. 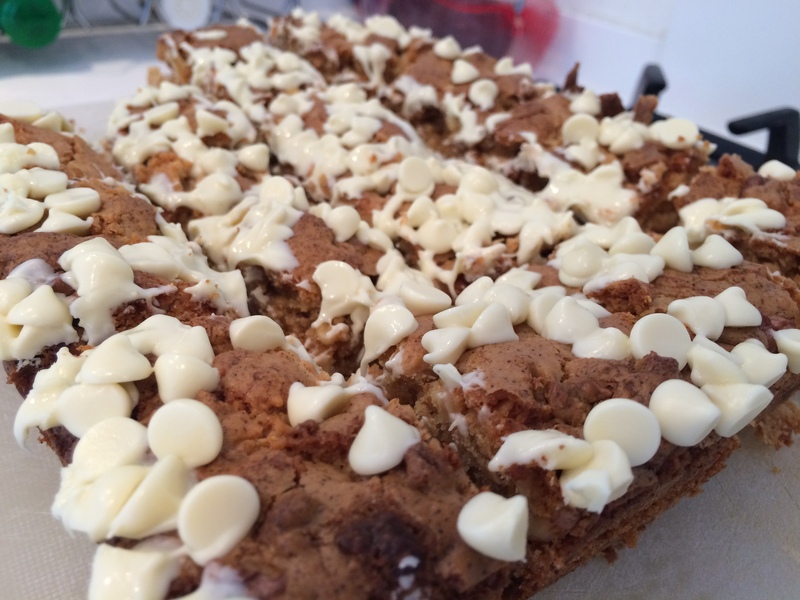 Leave to cool slightly then decorate with the white chocolate chips. Remove from the baking tray, cut into 16 and leave to cool on a wire rack.